When you think of Hawaii, you probably think about tropical cocktails, fresh coconuts and lazy afternoons on the beach. 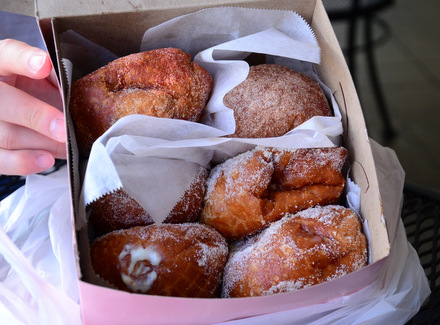 Those things are all easily available in Hawaii, but they’re not the only foods that locals love. SPAM is one of the islands’ most beloved foods, and residents of Hawaii consume more SPAM than any other state – and Hawaii is only the nation’s 40th most populous state! Going to SPAM Jam this year gave me the opportunity to see just how popular SPAM really is, and getting to taste some of the surprisingly delicious creations that local chefs put together to showcase SPAM inspired me to think outside of the can, too. This Hawaiian SPAM and Pineapple Upside Down Cake is inspired by Hawaii through and through. The cake is topped with rings of pineapple and studded with squares of SPAM, which take the place of the maraschino cherries that often top this type of cake. The SPAM is pan-fried before being placed inside the pinapple rings, so it has a bit of crispness to it that makes it remiscent of bacon. It is just salty enough to add an addictive salty-sweet element to the cake. For those who may be a bit uneasy about baking a dessert with SPAM, don’t be. 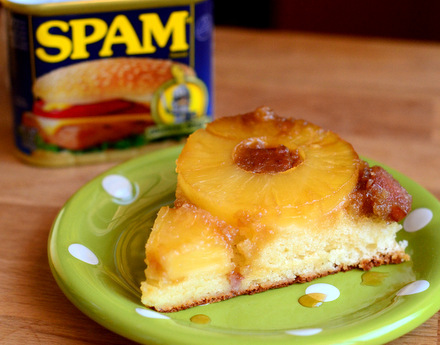 The SPAM has a supporting role to the caramel and pineapple in the cake’s topping, so you’ll still taste those flavors before you get that salty, savory flavor from the SPAM. The cake is delicious. 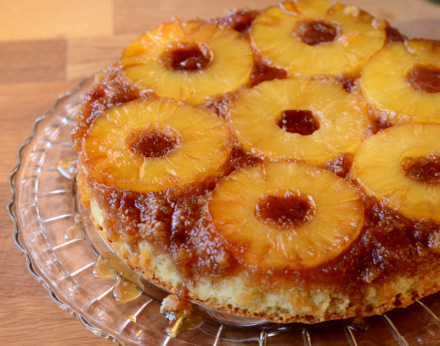 The cake base is light and fluffy, with a good pineapple flavor and plenty of rich, pinapple-infused caramel on top. There is just enough SPAM to contrast with the pineapple, but the pineapple still dominates the dish and reminds you that you are eating a dessert! If you’ve ever had a Hawaiian pizza, I recommend giving it a try. It’ll really give you a taste of the islands! Prepare the topping: Cut SPAM into fourteen squares, approximately 1/2-inch by 1/4-inch. Cook SPAM in a small skillet over medium heat until golden brown on both sides, about 3-5 minutes. Transfer SPAM to a paper towel to cool and drain. In a small bowl, stir together melted butter, brown sugar and salt. Pour into prepared pan and press into an even layer.Â Arrange pineapple rings on top of the sugar, placing 6 rings around the edge of the pan and 1 ring in the center. 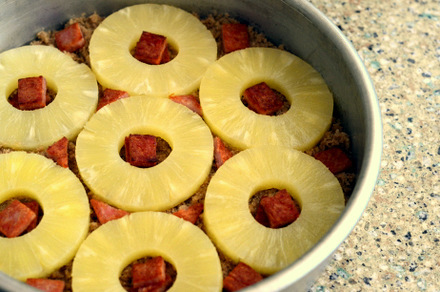 Place one square of the pan-fried SPAM into the center of each pineapple ring, and use the remaining squares to fill in any gaps in the pineapples. Set aside. Prepare the cake:Â In a medium bowl, whisk together flour, baking powder and salt. In a small saucepan, combine butter and pineapple juice. Cook over medium heat just until butter has melted. Remove from heat and whisk in vanilla extract. With the mixer on low speed, stream butter mixture in to the rest of the cake batter. When batter has come together completely, pour into prepared pan on top of the pineapple layer. My sister got married in Hawaii on Feb. 14, 2015. My mom kept complaining about the food in Hawaii. 1. The food in Hawaii is expensive. 2. She stayed at a Bungalow, and the dinner service was so-so. 3. The quality of food wasn’t worth the money spent… She didn’t go to a luau. My mom thought the locals weren’t that friendly. Trying some island food might have helped change her mind, but they were only there for a week so the bad food and bad service was a lasting impression of Hawaii. I’ve never been to Hawaii this spam idea is new to me. 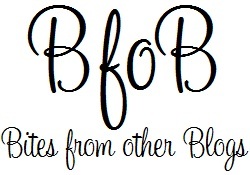 The blog post has pics of their Hawaiian wedding.